In the “Isn’t Paleo deficient in _________?” contest, calcium could probably give fiber a run for its money. The dairy industry has spent so much time and money burning the “calcium = dairy foods” association into our collective synapses that it might as well be called Vitamin Milk. So when you switch to Paleo, it’s perfectly natural to have some qualms about calcium. If you can handle dairy well, this isn’t a big issue for you – you can just keep getting your calcium from dairy products, and the problem never even comes up. But dairy is a gray area food for a reason. Plenty of us (65% of the world’s population, to be precise) are lactose intolerant, meaning that we can’t digest dairy and need some other way of getting calcium. Take a look at that number again for a minute. 65%: that’s more than half. So statistically speaking, it’s more common to be lactose intolerant than it is to be lactose tolerant. This ought to raise some question marks right away about the “need” for dairy products to get enough calcium. 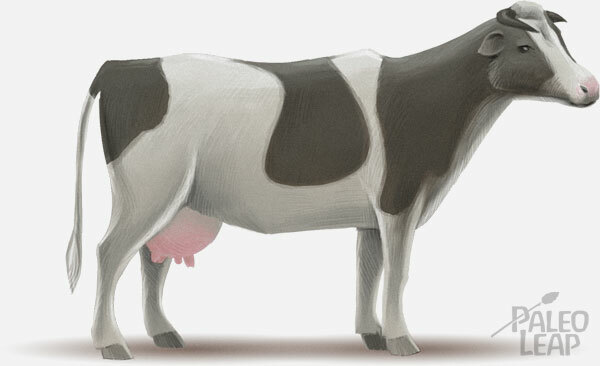 If you don’t have the gene for lactose tolerance, it means your ancestors didn’t evolve with dairy as a food source…and yet they still managed to survive, presumably with their bones intact! Clearly, there must be some other source of calcium around. There most certainly was another source – in fact, there were several sources. Calcium intake in the Paleolithic, before dairy was even an option, has been estimated at almost 1800mg/day, even higher than today’s recommended intake of 1000-1200mg/day. Calcium is a lot more complicated than just “eat more dairy,” and knowing the big picture can help you take the steps you need to actually take care of your bones. On the other hand, it’s also not as simple as just saying “eat more green vegetables and you’ll be fine.” If you’ve ever been vegan, you probably had broccoli or spinach at the tip of your tongue as a non-dairy calcium source, together with the fact that calcium from vegetables is more bioavailable than the calcium from dairy. That’s true…sometimes. But other times it’s not. And in any case, don’t you sometimes wonder about these vague generalizations about “green leafy vegetables” (all of them? Or just some?) and “more bioavailable” (how much more? Is the difference really that significant?)? Didn’t you ever want some actual numbers to go with that? If you did, you’ve come to the right place. In the rest of this article, you’ll find all the numbers – and possibly a few surprises. In some ways, calcium is a very misunderstood nutrient. A lot of people assume they only need it for their bones when in fact it does all kinds of other useful things. Athletes, for example, need their calcium because it’s an essential nutrient for muscle contraction. A healthy calcium intake is also crucial for nerve function (if you like feeling things when you touch them, thank calcium for it! ), blood pressure, and wound healing. Calcium is also important for maintaining body pH – even though the acid/alkaline foods hypothesis is a complete myth, it’s still important to get enough calcium to keep your body in pH balance. On top of the shortsighted focus on bones, calcium is also misunderstood in another way: the idea that more is always better. Inadequate calcium is bad, no doubt about it, but the dangers of calcium overload are just as real. If you eat more calcium than your body can use, you run the risk of depositing it in places where it really shouldn’t be, including your kidneys (as kidney stones), and your arteries (as plaque). Like most nutrients, too little is bad, enough is good, but more is not always better! Luckily, too much calcium is very difficult to achieve from whole foods. To get these effects, you’d need to eat over 2500mg of calcium, over twice the RDA. Realistically, it’s only going to happen if you’re taking a high-dose supplement. So how much calcium to you really need to get all the advantages, with none of the potential drawbacks? The RDA of calcium is 1,000mg (for men) to 1,200mg (for women), but we’re going to get a little more precise than that. The number the RDA is based on, the number that really matters , is how much calcium you absorb, not how much you eat. The average adult needs 300-400mg of calcium to be absorbed every day. This means that the amount of calcium you need from food will depend on how absorbable that calcium is. If your calcium source is 100% absorbed, you’ll only need 300-400mg. In reality, this never happens, because no source of calcium is 100% absorbed. If your calcium is only 32% absorbed (milk and dairy products), you’ll need something like the RDA. But most vegetables are better absorbed than this, so you’ll actually need to eat less (more specifics on this in a minute). 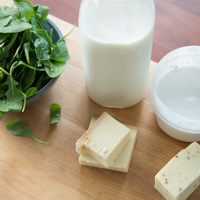 To get a good idea of how much calcium you’re actually getting from your diet, you need to answer both those questions. Because this is pretty detail-heavy, it does get a little mathematical at times, so if math isn’t your strong suit, you can skip down to the last chart to see the final result of all the calculations without wading through the arithmetic. On the other hand, if you’ve been itching for an excuse to stretch those mental muscles, here’s your chance! First up, the easy question: how much calcium is actually in all of these calcium-containing foods? Check out some Paleo-friendly non-dairy calcium sources below, ranked from best to worst (with milk included for comparison). Mineral water (e.g. San Pellegrino) 20oz (the size of a vending-machine bottle) Varies; the average for the US and Canada is 122mg. Bone broth 8oz (1 cup) Unknown, and varies from batch to batch. *This doesn’t look at all impressive, but consider how much tap water you consume in a day. Most people will end up drinking at least 1.7 (87mg calcium) liters from fluids like water, coffee, and tea, plus more in cooking food like soup and broth. And since calcium isn’t affected by heat, cooking doesn’t reduce the amount of calcium that you take in at all. The bad news: filtering your water removes this calcium. So if you use a water filter, you can count this source out. That answers the first question, about how much calcium is on your plate. 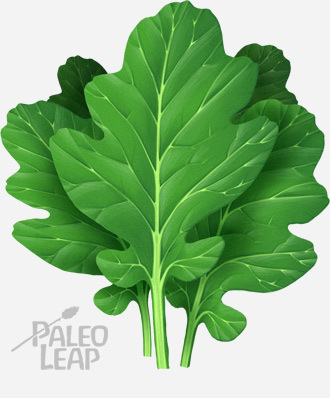 Clearly, it’s possible to get plenty of calcium from Paleo food sources, especially bones and dark leafy greens. But that’s not the end of the question, because we still haven’t covered how much of that calcium is absorbable. So on to part 2: how well do these sources stack up in terms of bioavailability? How much of them do you actually have to eat to get the 300-400mg of absorbed calcium that you need? The reason why vegetables have so much variation here is their varying content of two antinutrients, phytates and oxalates. Both of these antinutrients bind to the calcium in the vegetables – it’s there, but you can’t absorb it because it’s already spoken for. Spinach has a particularly high content of oxalates, accounting for the low bioavailability of the calcium it contains. So if you’ve ever heard any arguments that spinach has more calcium than milk, you can be sure that the person telling you that hadn’t done their homework properly. Looking at this table, it’s clear that some commonly-touted “vegetable calcium sources” are actually terrible sources, because barely any of the calcium is bioavailable at all. Sure, it’s technically there, but you’re not getting any benefits from it. On the other hand, some food sources (like carrots) have a high bioavailability but not much calcium there to absorb. This really complicates the list of non-dairy calcium sources. This is a lot more accurate than a straight-up list of calcium content, because it automatically corrects for how absorbable the calcium is. This is calcium, as your body sees it. So judging from this more accurate picture of the absorbable calcium content (not just the calcium on the label), is it still possible to get all the calcium you need from Paleo foods, without dairy? Absolutely. Remember, the daily requirement of absorbed calcium is only 300-400mg; it’s easy to see how you could meet this requirement if you eat 3-6 servings of green leafy vegetables every day and some bone-in fish a few times a week. You can also “stock up” on some days to make up for lower-calcium days: calcium is one of those nutrients you don’t need to get every day, so if you have chicken once a week and chew off the ends of your bones, you’ll probably be fine. Vitamin D is a cofactor for calcium, which means that you can’t absorb calcium from the gut without Vitamin D. In one study, after eating a meal with 301mg of calcium, a Vitamin D-deficient group only absorbed 43mg (14%), while a group that had received Vitamin D supplements until their D levels were normal absorbed 175mg (58%). That’s a below-average absorption rate for the deficient group, but an above-average rate for the normal-level group. In other words, it seems to be the case that a Vitamin D deficiency can lower your absorption rate below what was specified in the other studies, while adequate serum levels of Vitamin D will result in the absorption of even more calcium. Good news for the sun lovers: your beach habit might actually be helping to keep your bones healthy. Fortunately, many animal sources of calcium – like salmon and sardines – are also excellent sources of Vitamin D. So when you’re eating these foods, you’re really getting a two-for-one on bone health. Alternately, sun exposure or a high-quality supplement are your best bet. Another one of calcium’s very best friends is Vitamin K. Vitamin K is responsible for keeping calcium in your bones and teeth (where you want it) and out of your arteries (where you don’t). Vitamin K has two forms (K1 and K2). You can convert K1 to K2, but it’s not very efficient, so ideally you’d be getting dietary sources of both. Like Vitamin D, both of these forms tend to occur in calcium-rich foods. 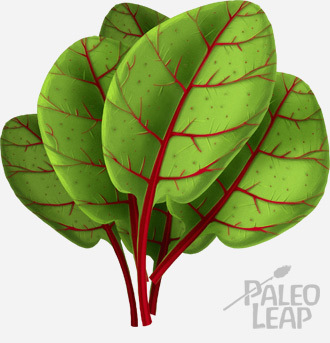 K1 is found in almost all leafy green vegetables; K2 is found in grass-fed (but not grain-fed!) milk and dairy products and some fermented foods like natto. When it comes to cofactors for calcium, Paleo has a distinct advantage over the standard American diet: how many people eating a modern diet get regular doses of grass-fed butter or fatty cold-water fish? When you’re willing to step out of the low-fat dogma and enjoy fatty, nutritious whole foods, you get the whole spectrum of nutrients that you need for good bone health (not to mention everything else). It’s clearly possible to get adequate calcium from food alone. But what if you don’t like bone-in fish? Or what if you’re struggling to get 3-6 cups of leafy green vegetables every day? Is it OK to take a supplement? Calcium supplements are tricky. For one thing, there are a lot of different forms, and many of them aren’t well absorbed. And then there’s very conflicting evidence about whether or not they actually provide a net benefit. A meta-analysis in 2007 concluded that supplemental calcium was effective in reducing fractures. Another meta-analysis concurred. But the catch is that the size of this effect varies a lot. In trials where the study subjects lived in an institution like a hospital, where the researchers could make absolutely sure they were taking their supplements properly, the effect was fairly large (around 24% lower risk), while in the real world the effects were much smaller (less than 10%). On the other hand, there’s just as much evidence to show that calcium supplements are ineffective, or even harmful. For example, this meta-analysis found that calcium supplements higher than 500mg/day increased the risk of myocardial infarction (heart attack) by around 30%. You can argue back and forth whether this was due to the type of calcium supplement given, or the particular dose, or individual errors in the studies, or bias in the sample groups, or anything else, but the take-home is that we still aren’t sure whether calcium supplements are really a net benefit or a net danger. Given that you can get plenty of calcium from whole foods, it seems to be safer and more effective to avoid supplements where you can. If you made it through all that math, congratulations! Your bones – not to mention your muscles and your heart – thank you. It’s a lot of arithmetic, but hopefully it should lay to rest any doubts about Paleo and calcium: you can get all the calcium you need from a diet rich in bone-in fish and leafy green vegetables, and there’s no need to either take supplements or eat dairy if you don’t like it. You shouldn’t even have to count your calcium regularly: Paleo is about enjoying your food, not tallying up grams and micrograms! Chew on the ends of your chicken drumsticks, make bone broth regularly, enjoy plenty of leafy green vegetables, and get some bone-in fish once in a while: you’ll be all set for calcium without any milk or dairy at all.